Robert B. Lancia (R) was first elected in November 2014 as the State Representative from District 16, Cranston. 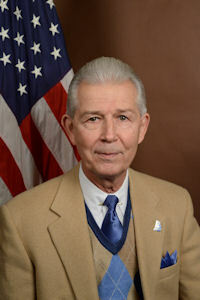 He is a member of the House Committee on Health, Education and Welfare, the House Committee on Environment and Natural Resources, and the House Committee on Veterans’ Affairs. Born November 24, 1953, Representative Lancia and his wife Maryann have three children, Lisa, Scott and Amy, and seven grandchildren. A former Navy chaplain and disabled veteran, retired, Representative Lancia graduated from Cranston High School East in 1972 and received a Bachelor’s degree from Rhode Island College in 1976. He received a Master of Divinity degree from Andover Newton Theological School in 1991; a Doctor of Divinity degree from United Theological Seminary in 2000, and a Master of Arts in religion and psychology from Andover Newton Theological School in 2001. He is a member of the Greater Cranston Chamber of Commerce, the Disabled American Veterans, the Military Officers Association of America and the Veterans of Foreign Wars.